Our horseman astride his mount. 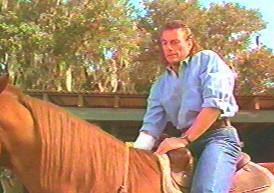 There were two things that attracted us to Hard Target. The first is that it stars one of the four Cinematic Horsemen of the Apocalypse, Jean-Claude Van Damme. We have followed Mr. Van Damme's career since his US breakthrough in Cyborg. We have stuck with him through such lows in his career as Double Impact, and through such lows as Street Fighter. Whole lotta lows, really, but we watched them all. We can not watch, and yet we can not look away. The second attraction for us is that it is directed by John Woo, one of the most amazing directors to come out of Hong Kong. John Woo went from making rather nondescript movies to making films that defined a genre: The heroic bloodshed thriller. Fans of HK cinema held their collective breath when Hard Target appeared, waiting to see what carnage Woo would wreak with a Hollywood budget. What a surprise that the actual film seems so unremarkable. Jean-Claude plays Chance, a down on his luck Cajun sailor. He is hired by Nat Binder (Yancy Butler) to help her find her father, a homeless ex-Green Beret. What they do not know is that the elder Binder was murdered for sport. The villain of this story is Fouchon, a mercenary who sells a very unique commodity. For a price, his customers can hunt a kill a human. The victims are found among New Orleans' homeless community. So Chance crosses guns and karate with Fouchon and his head goon, Pick. As the tag line advises, "Don't hunt what you can't kill." This would be a serviceable plot, but the acting does it no favors. Jean-Claude is probably at his best here, but his best is not all that great. At least the fact that he's playing a Cajun explains his outrageous accent, and Jean-Claude actually makes a fairly good stab at adding gen-u-ine Cajun inflections to his speech. For anyone doubting us, we would suggest watching Street Fighter, which demonstrates how bad JCVD can be with a bad voice coach. Yancy Butler plays Nat ("Your parents named you after a bug?"). By which, we mean she exists in the physical space that Nat is supposed occupy. She certainly doesn't do anything to make us believe that she is Nat. She seems to avoid acting at every turn, sometimes going so far to actually anti-act, a trick only a few other (ahem) thespians have managed. And we imagine that Chance and Nat are supposed to develop some sort of relationship in the course of the film, but the only possible chemistry Van Damme and Butler share is what they learned in a high school class. Add into this mess the always reliable Lance Henriksen. Henriksen, whose face recognition has gone up quite a bit since he landed the role of Frank Black on TV's Millennium, plays the role of Fouchon. Lance growls his way thorough his role with authority rarely found in B-movies. He really makes the movie for us. Of special note is the scene towards the end of the movie where Fouchon is set on fire by one of the miraculous explosions Chance causes with his shotgun. In this scene you will see that Henriksen is actually set of fire. OK, it's a small fire, and it's confined to the jacket he's wearing, but still, when was the last time you saw Ah-nuld or Sly wearing something that was on fire? In interviews, Henriksen was really gung-ho about being set on fire, saying it was something he always wanted to do. 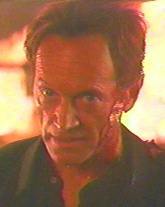 That Lance Henriksen, always willing to sacrifice for his art. Arnold Vosloo also deserves kudos for playing Pick, Fouchon's right hand man. The South African actor is very menacing and cool in this role. 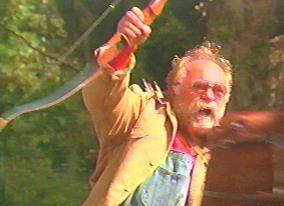 And special mention must go to Wilford Brimley, who plays Chance's rustic Uncle Douvee. He brings fun to this movie in two ways. First of all, you can make lots of jokes about Quaker Oats and his famous quote: "The right thing to do, the right way to do it." Second, his Cajun accent and dialogue is really funny. Wilford Brimley seems to have untapped talent -- who knew? If they ever make a movie about that Cajun chef guy, count Wilford as a shoo-in to play the title role. Hard Target features just enough signature John Woo touches to keep it interesting to Woo's fans. There is slow motion, some cool kung fu, and lots of striking imagery, like an arrow whizzing by just inches from Fouchon's head, or the entire climatic gunfight in the Mardi Gras graveyard. Apparently, there are two or maybe three other versions of this movie. One is available on Japanese LD, and has an expanded finale. This may be the same as the version that was released in Europe. And finally, there is a work print, rumored to be Woo's preferential version, that you can find at certain video outlets that don't limit themselves to official releases. Any huge fans of Woo out there may find it worth their while to search the workprint out. Bottom Line? For a Woo movie, Hard Target isn't so great. Word is that the studio took the final edit away from Woo and essentially mangled it, so Woo fans might be disappointed. Van Damme fans, however, will be pleased to see their man at his best, especially with Henriksen as a co-star and that John Woo magic behind the camera. Frankly, Van Damme's presence kept this from a four-lamp rating, and Woo's presence kept it from a two-lamp rating. Rent and watch at your own risk. Addendum: eventually we did come across a copy of the Director's Cut. Read our review of that version.